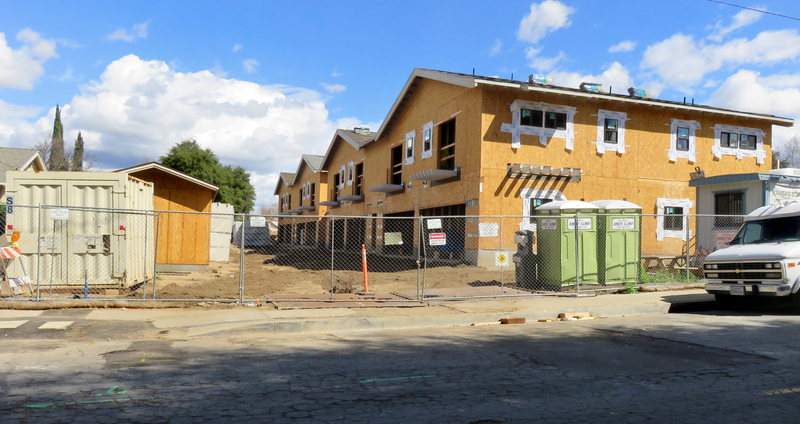 SCVHistory.com LW2763a | Newhall | Apartments Under Construction, 24514 Kansas Street (Ex-Newhall School Building Site), 2015. February 28, 2015 — Apartment units under construction at 24514 Kansas Street, where a section of the third Newhall School building once stood. Development by Kansas Street Partners LLC (an affiliate of JSB Development), which is both the property owner and developer. The 24514 Kansas Street property was never the address of the school; rather, the school stood around the corner on Lyons Avenue (aka 10th Street, aka Pico Road) from about 1911 to 1925 when the Newhall School District abandoned it in favor of a fourth and larger school building at the current school location, 24607 Walnut Street (see news stories here). The school property (land and building) was sold for $4,910 in late 1925 to real-estate developer Arthur B. Perkins (who was also the town historian and justice of the peace). Perkins split the building into three sections and moved the main, center section to what is now 24514 Kansas Street. The center section was used as a private home from that time (1926) until shortly before the summer of 2014 when the city of Santa Clarita authorized the demolition of the 1,181-square-foot structure, along with a 448-square-foot detatched garage and 223-square-foot storage building (see permit here), to clear the property for the apartment project. LW2763a: 19200 dpi jpeg from digital image by Leon Worden.